Last week O’Reilly Media hosted the Solid Conference in San Francisco I thought I’d post a quick summary of the high level themes that I heard talked about. I know what you’re thinking, another conference where speakers spit out buzzwords like 3D printing, internet of things, drones, crowd-funding, and so on but I was utterly impressed by the rigour and depth of the presentations and curation of content at O’Reilly’s Solid conference in San Francisco last week. Although anyone looking carefully at design and technology can see that there’s been a steady shift towards the harmonic unity of hardware and software – a merging of digital services and physical products, it is still important to see O’Reilly formalize this shift in thinking and acknowledge the momentum that has gathered at this conference. You probably heard this one before, but what does it mean exactly? At Solid many presentations suggested that not only are many of today’s products a combination of physical materials and digital media, but some of the more successful examples of hardware/software hybrids are discovering harmony between digital and physical attributes across objects and services. 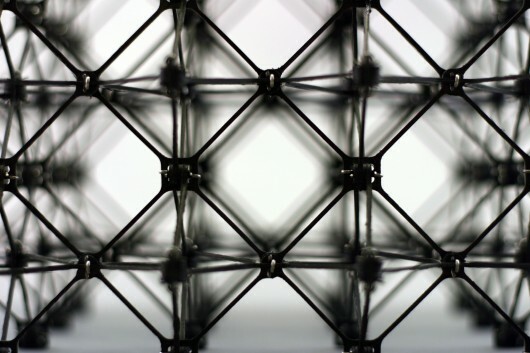 Not only are hardware and software merging together but Neil Gershenfield (MIT) and a few others suggest that we’re close to creating new materials that have digital computing capabilities within. It’s difficult to conceive but we’ll be able to turn data into things and things into data. There was a particular quote that I enjoyed by Gershenfield, “There is no machine, the material is assembling itself” when describing their new research project. Gershenfield went on to describe a few applications of this new digital material starting with airplanes, then moving to the work MIT is doing with Homeland Security to deploying the material to assemble mountains that act as barriers to hurricanes. Yes, I know, mind-blowing. As the world becomes embedded with sensors and semi-smart objects networked together we’re able to bind them all together with software. The opportunities become abundant when these devices are interconnected and software APIs allow us to request and push data throughout systems. Probably the single most quoted example at Solid was Nest and it’s easy to see why. The Nest product is a neatly packaged bundle of hardware and software that takes advantage of its network capability. As you add more Nests to your home the value of their service increases. This intentional design perspective is emerging as we move towards creating networked objects. On day two, Tim O’Reilly drove home the point of user experience becoming a critical component of a usable internet of things. He urges that we think deeply about both the implicit and explicit levels of interactions of networked objects and their systems. “We can use new hardware sensors not just to capture data or talk to other devices, but to create new interactions”.